This was a character for a story. 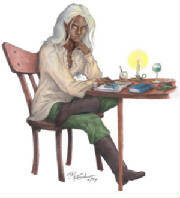 The client/writer has an interesting perspective on the drow, or dark elves. Usually described as having oil-black skin, she visualized them as just having dark complexions, similar to african skin. The result was quite fascinating. 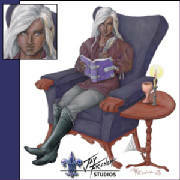 The first is the most recent, "The Drow Book", where we used a combination of a number of facial references to create the right face for him. The next is an older illustration of the same character (titled "The Study"), and was produced in 1997. Click on the thumbs to view the images larger!